What’s better than curling up in a warm sweatshirt with a good comic? Image Comics is pleased to bring fans of Jeff Lemire and Emi Lenox’s beloved PLUTONA miniseries a very special sweatshirt. A replicate of the sweatshirt worn by Mie in the critically-acclaimed PLUTONA—a story about five suburban kids discovering the body of the world’s greatest superhero in the woods one day—the PLUTONA sweatshirt is available at participating comics retailers and will be sold directly to consumers at the Image Comics booth at WonderCon, Emerald City Comic Con, San Diego Comic Con, and New York Comic Con while supplies last. 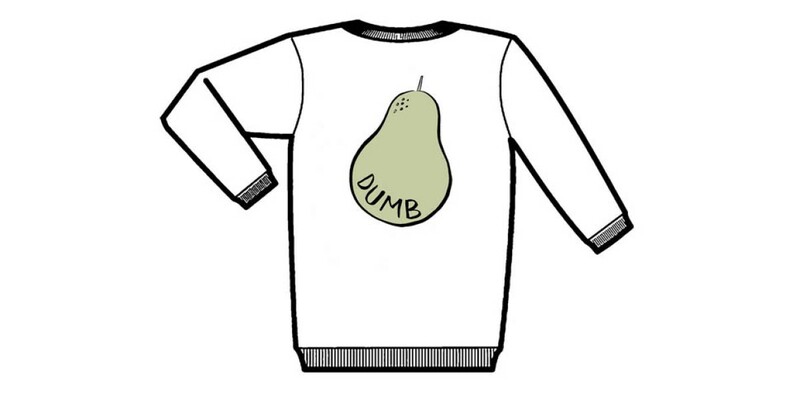 Readers can join in on the heartfelt, coming-of-age journey with their very own pear-featured sweatshirt. PLUTONA (ISBN: 978-1-63215-601-3) trade paperback hits comic book stores on Wednesday, May 18th (Diamond Code MAR160642) and will be in bookstores on Tuesday, May 24th. It can also be pre-ordered at Barnes & Noble, Amazon, and IndieBound.